Overlooking the rainforest of the Khao Sok Thailand, Khao Sok Riverside Cottages is the perfect place to explore, swim, and relax into nature. 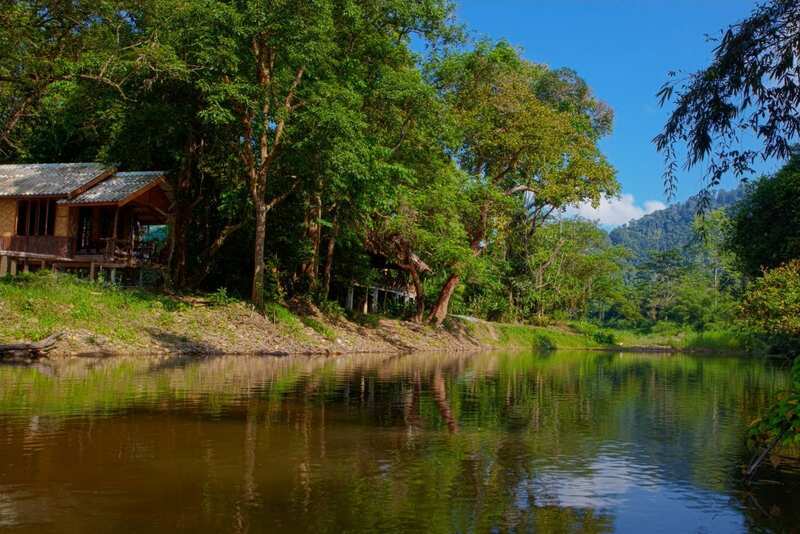 Our khao sok national park resort sits on the river a few kilometers east of the Park Headquarters, pleasantly apart from the noise of Khao Sok’s town center. Are you wondering where to stay in Khao Sok? 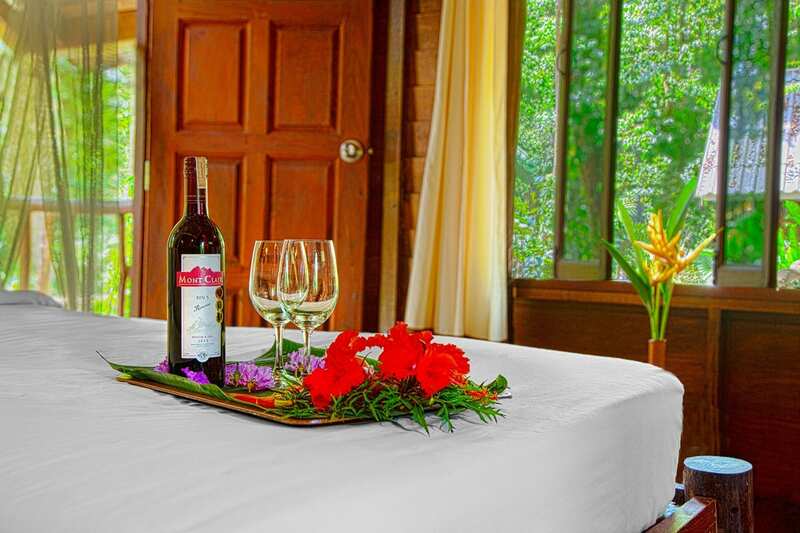 Enjoy the best accommodation Khao Sok National Park has to offer. Our comfortable wooden cottages nestled between forest trees and tropical gardens, across the river from the ancient jungles of Khao Sok National Park – Thailand’s oldest and most diverse ecosystem, where elephants still roam free. 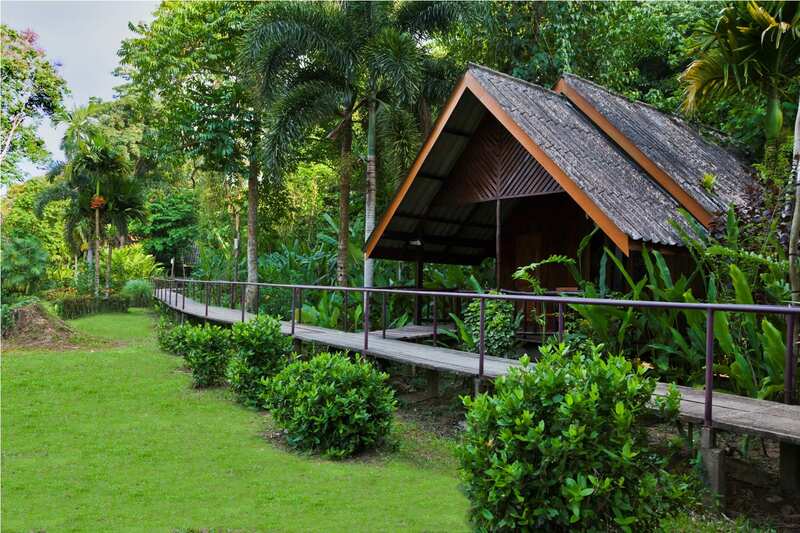 Riverside Cottages is less than 3 hours travel from Phuket, Krabi, or Koh Samui. We’ll pick you up for free at the local bus stop, and can also send a private car. 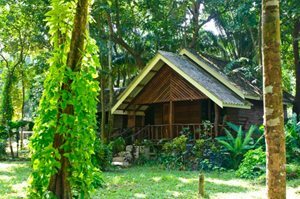 What makes Khao Sok Riverside Cottages such unique Khao Sok lodging? We’re a family-owned resort, and our English-speaking staff will show you genuine Thai hospitality from your first email to the time you depart from our hotel . Your accommodation will be clean, and your food delicious, so you can explore Khao Sok National Park from a comfortable base. Responsible tourism – we love Khao Sok, and we have 10 years of experience in giving back to the community and environment by building schools, training guides, and teaching children. Want the best price? Book a package! 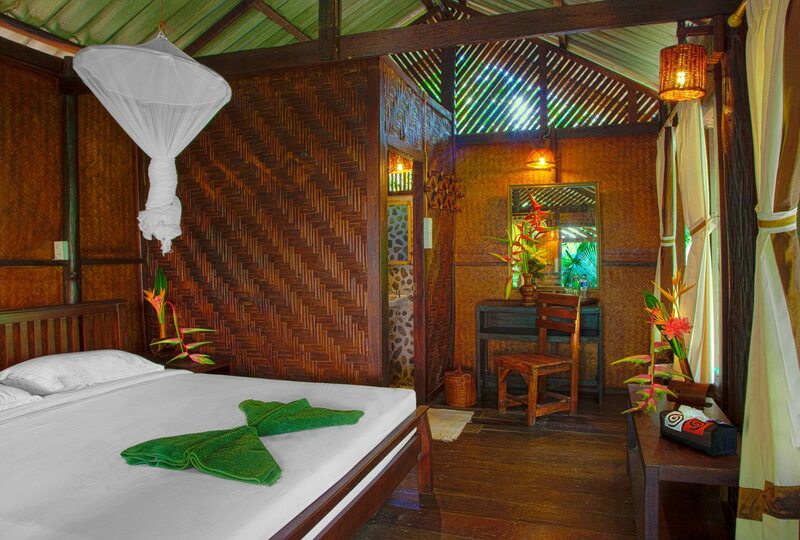 Our Khao Sok national park resort features all-wood Thai-style rooms that bring together comfort, cleanliness, and natural beauty. Sleep well on a new mattress, and enjoy the view from a private deck overlooking the river and jungle of Khao Sok National Park beyond. At Khao Sok Riverside Cottages we offer two types of rooms, Jungle Houses nestled between forest trees and River Cottages that are closer to the river. 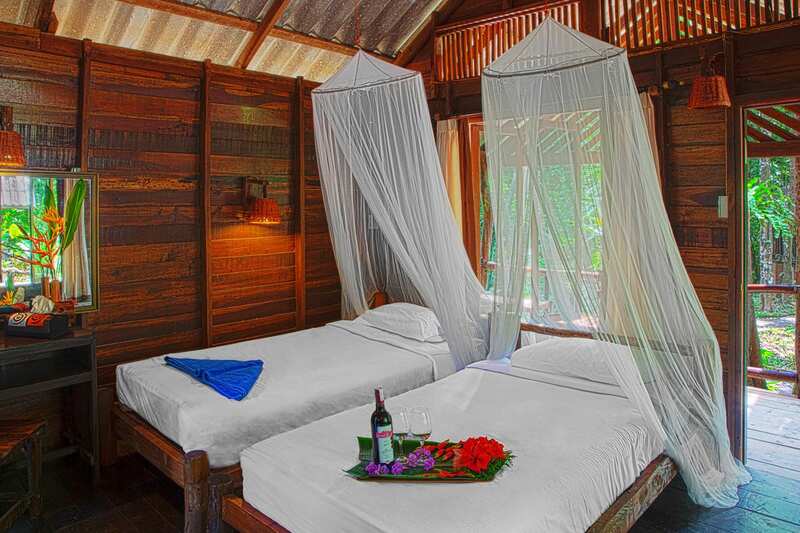 All rooms have Wifi internet for your convenience, and fans and mosquito nets for your comfort. Couples and friends enjoy our 2 person rooms, and families can stay in our triple and 4-person rooms. What to do in Khao Sok? This part of Thailand is a natural paradise, and we love to share our favorite jungle hiking trails, wildlife safaris, elephant experiences, canoe trips, and floating bungalows with you. You can book one of our Khao Sok tour packages ahead of time, or you can choose your activities upon arrival at the hotel. You can spend half of your day hiking in the National Park, return to Khao Sok Riverside Cottages to swim and enjoy a delicious lunch, and end your day at the rejuvenating hot springs. Many visitors also choose to spend a day or overnight at the Khao Sok or Cheow Lan Lake. Longtail boats will take you into the lake, surrounded by majestic cliffs covered in lush greenery. Keep a lookout for leaf monkeys, Lar gibbons, as well as blue-eared Kingfishers and the Asian fairy bluebird. Be sure to visit our Blog Page for expert information on Khao Sok and activities. Favorite posts include our Top 6 Khao Sok activities, Top 3 Hikes, Khao Sok Wildlife, and Cheow Larn Lake Checklist. Our friendly staff can help you plan your stay to perfection! 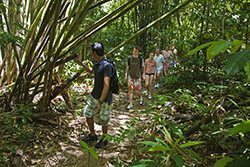 Whether you are seeking adventures in the deepest jungle, or traveling with young children, we have the activity for you! Cheow Lan Lake is the highlight of Khao Sok National Park and also one of the most scenic places to visit in all of Thailand. Khao Sok National Park is one of the best places to go hiking in Thailand. The rainforest offers an abundance of wildlife. 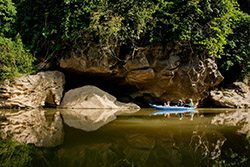 Riverside Cottages organizes local adventures – including canoe trips, river tubing, elephant bathing, trekking as well as bird watching. Relax with a traditional Thai massage. Alternatively visit the hot springs. 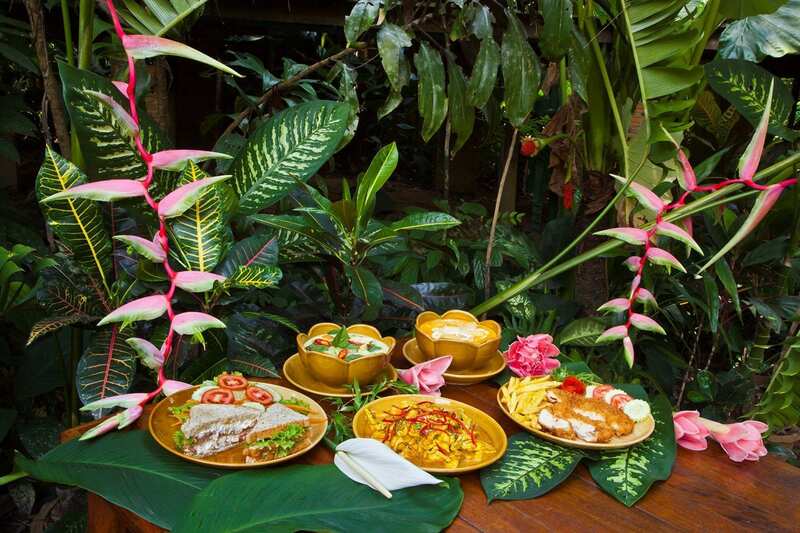 Learn Thai cooking or get to know the locals in Khao Sok. 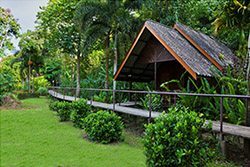 When you are searching for places to stay in Khao Sok national park you will find a variety of different types of Khao Sok lodging. 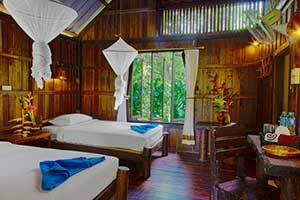 You will also find that accommodation Khao Sok national park is spread out. Some resorts are near the entrance to the park and within the boundaries of Klong Sok village. Others are spread out across the forests and orchards in the sub-district of Khao Sok, Thailand. What they nearly all have in common is some proximity to the Sok River. The Sok River provides a relaxing outlook when wining and dining but also provides some of the best Khao Sok activities. Enjoy a guided canoe tour or get even more wet while tubing in rubber rings. All manner of jungle wildlife gathers at the river. Leaf monkeys and many tropical birds perch on tree branches, while frogs and fish inhabit the water. Further upstream in the park, some of our largest friends, the Khao Sok elephants, cannot exist without regular access to water. They enjoy cooling down, cleaning and just having fun in the river. The river changes quite a bit at different times of the year. In the wet season the banks are full and perfect for “tubing” on rubber rings. On the other hand in the drier seasons it is much calmer and more suitable to a relaxing dip. 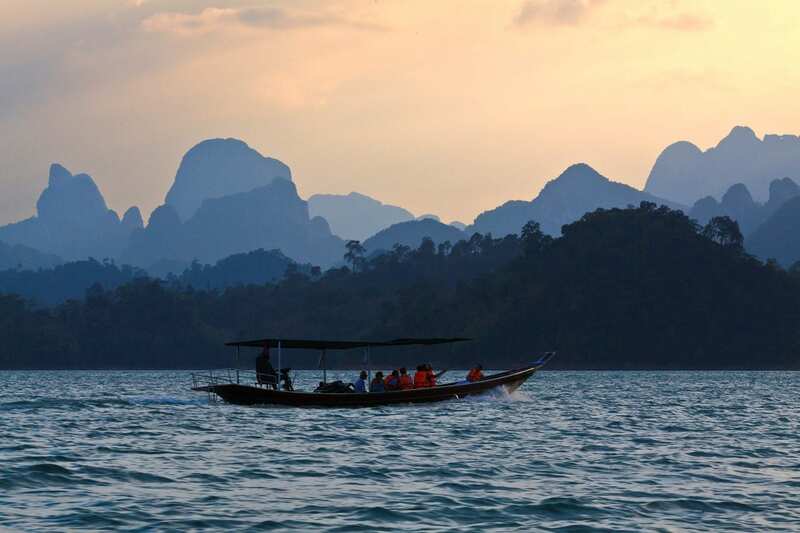 Most people journeying to Khao Sok are drawn to the wildlife, hiking and adventures available in the national park. While hiking normally starts from the park headquarters, most other activities originate elsewhere. Canoeing starts at one of the many bridges crossing the Sok River. Cheow Lan lake tours to the floating bungalows start an hours drive to the east at Rajaprabha Dam. When choosing where to stay in Khao Sok, look for the rooms and resort grounds the most appeal to you. Khao Sok Riverside Cottages has plenty of shuttles to get you to the park, and a variety of nearby highlights. 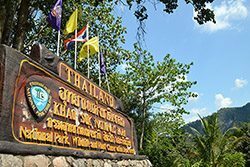 If you are looking for places to stay inside Khao Sok national park itself, you are limited to jungle camping or heading to one of the floating bungalow facilities. Camping requires a private tour, whereas visitors wanting a Khao Sok Lake tour can join a group. It is fair to say that a visit to the Cheow Lan lake will be at the top of your list of things to do in Khao Sok. The scenery is almost beyond belief. Limestone karst cliffs rise sheer from the deep clear waters of the mighty Cheow Lan. Longtail boats cruise around ferrying people to the floating bungalows and ranger stations that populate the lake. It is an experience never to be forgotten. We will be able to take care of all your arrangements when you arrive at Khao Sok Riverside Cottages. Either book a package in advance or talk to our friendly, knowledgeable and efficient staff. They love to show off their neighborhood and are proud to be part of this amazing adventure. 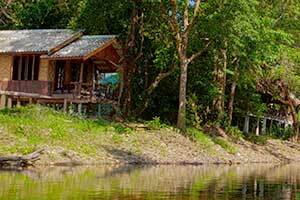 You will find that Khao Sok Riverside cottages provides the best of all worlds when looking for your Khao Sok national park resort. We are right next to the river. Relax in our restaurant bar area. In addition go for a refreshing swim and meet some of the local wildlife as well. Our staff arrange transport for our guests all around the area as well as for your inbound and onward journeys. We look forward to welcoming you to one of the most amazing places you will visit. Are you looking for some adventure, incredible sights of nature and experiencing the places that you travel through? 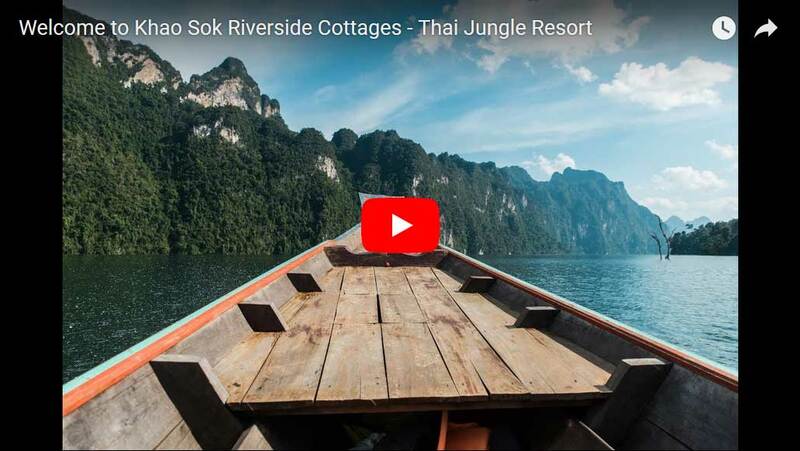 Then you are going to really enjoy Khao Sok Riverside Cottages and Khao Sok, Thailand. This is a natural playground which we love to share with our visitors. We will also help you make the most of your time here. Our staff and all the locals are dedicated to making sure you have a great time during your stay here.